Created with the single person in mind, this five piece set combines a useful selection of our more modest sized pieces along with two lids. Whether you're cooking for yourself or sharing with a friend or two, this practical set will exceed your expectations. 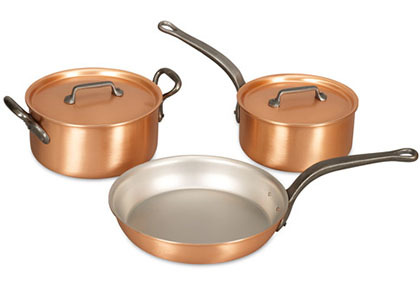 Enter the world of Falk Culinair solid copper cookware. 21st century technology and heirloom quality. The communication and service I received was second to none as these pans were a surprise birthday present I had some special delivery requests which were all met. They even included a card which I didn’t request. 703 customers found this review helpful. Did you? Yes, I did!